Audi dominated Monday's tests but Peugeot fought back on Tuesday. I say this, though it's not strictly true. 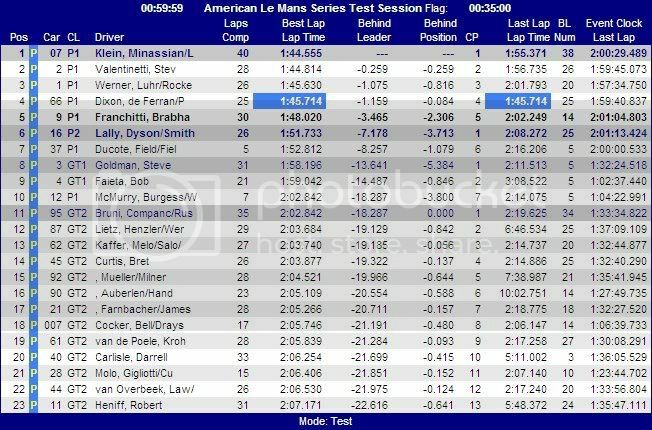 When I looked at times for the 2nd test on Monday, the 07 Peugeot was 3rd then proceded to climb and was 1st for a while but when I next checked it was lower and finally finished in 4th that evening. Nevertheless, this is only a test, so you can't read too much into it! The first practice starts in a few minutes. I'll update more later, probably when both practice sessions have been done.